The breadfruit tree primarily belongs to the South pacific Islands, although we now find it throughout the tropical areas of both the hemispheres. Some of you may remember the story of Captain Bligh and Mutiny on the Bounty. But you might not remember that the mutiny was caused because of the breadfruit tree. The Bounty, a ship, was sent to Tahiti in 1789 to pick up saplings of the breadfruit tree and carry them to the West Indies for cultivation. But the ship was facing acute water shortage and the crew rebelled when they found that the saplings were being watered while they were dying of thirst. The whole expedition failed because of their mutiny. The breadfruit belongs to the mulberry family, Moraceae. Some also call it the ‘breadnut’ tree. It is closely related to the jackfruit found in India, Sri Lanka, and Indonesia. In fact breadfruit has been successfully grafted with jackfruit by many farmers in India. It is an important food of the South Pacific islands. There are many different kinds of breadfruit which ripen at different times. So the people of the islands have a constant supply of the fruit. The breadfruit tree is handsome and grows very fast reaching up to 85 ft in height. It has many spreading branches, with leaves clustered at the tips. The leaves are large, glossy and oval shaped with bright yellow veins. But the flowers are tiny. There are two main types of breadfruit- the ‘wild’ type that has more seeds and less pulp and the cultivated seedless type. The first kind grows from seeds while the seedless kind grows by transplanting suckers which spring up naturally from the roots. Breadfruit grows best in a hot and moist climate where the water is properly drained. It cannot stand frost or too much cold. The fruit is either round or pear-shaped. It is green at first. But it turns from brown to yellow when fully ripe. It has a white pulp. Some fruits may have a harsh, sandpaper-like rind. When fully ripe it gets quite soft inside and has a sweet smell. All parts of the breadfruit tree contain a milky, gummy latex. People eat ripe breadfruit like ripe jackfruit. They also eat raw breadfruit like a vegetable the way we have tender jackfruit curry in India. People of the South pacific islands eat breadfruit in many ways. Some roast it on hot coals. Others slice the fruit and dry it in the sun, after which it is baked. Some stuff the core with grated coconut before roasting. People of Malaya peel the ripe breadfruit, slice the pulp and fry it in syrup until it is crisp and brown. People from Philippines cook the fruit with coconut and sugar. Others bake it whole in a pan with a little water. There are some who prefer to ferment it before baking so they bury the fruit until it is adequately fermented. You can make flour from dried breadfruit which is very nutritious because it is richer than wheat flour. It is mixed with wheat flour before making bread in many parts of Brazil and Barbados. The breadfruit has many other uses. 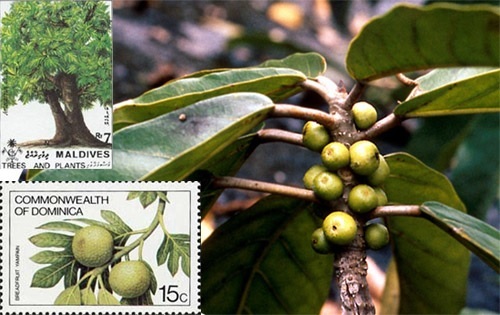 Breadfruit leaves are fed to cattle and goats. A coarse kind of cloth is woven from the inner bark of the breadfruit tree. The latex is often used as a kind of glue for catching birds. It is smeared on the tips of long poles and the birds sitting on the poles get stuck. The wood from the breadfruit tree is not very hard but it is strong and elastic and is used for constructions and making furniture, canoes and poles. The wood is also used for making surfboards because it is so light. People in the Philippines use breadfruit fiber for making harnesses for water buffaloes. In Oceanic mythology the breadfruit tree symbolizes creation and God’s unlimited generosity.